Here’s an overview of each, to help you find the right one for your intended application. As you may be able to guess, these fire pump systems are specifically designed for compliance with NFPA 13R applications. Some examples of such applications would be mixed-use residential and commercial buildings, assisted living centers, and smaller apartment complexes. You can choose from five standard models, all built around a listed vertical inline fire pump with a limited-service controller and optional jockey pump. 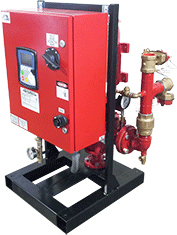 Flow rates for the 13-ULV fire pumps can range up to 250 GPM. The G-Series fire pump systems are compact units designed to take up as little floor space as possible, but still offer simple installation and easy access to all necessary equipment. These are NFPA 20 compliant just like the ULR models, and are available in diesel or electric. Each of these systems will be designed specifically for your site plan and design conditions, so you can be sure you’re getting exactly what you need. To learn more, or to order your commercial Talco Fire System with industry-leading turnaround times, give the team at Steven Brown & Associates a call today at 302-652-4722 at extension 103 to get started!